If the original Google Pixel has been on your mind, Woot! is giving you two different ways to purchase the phone. You can buy a new unit in the box with a price tag reading $299.99 for the model with 32GB of native storage, or pay $349.00 for the 128GB variant. At those prices you are saving 54% and 50% respectively, off of Woot! 's regular prices. You can have any color you want as long as you want Quite Black. And the device will work with Verizon, Sprint, T-Mobile and AT&T. Now, if you're buying this as a placeholder until the Pixel 3 is released later this year, or you just want to save some money generally, Woot! is offering a refurbished 32GB Pixel for $199.99. Available in Quite Black only, these previously used handsets are in working condition, but do have some dents, scratches and wear. However, if these models looked as good as they work, the price wouldn't be as low. Shipping is free to Amazon Prime members, and there is a limit of 10 units per customer. There are only two days left for you to buy the refurbished Pixel handsets, and the deal on the new units goes off the board in 12 days. To take advantage of either opportunity, click on the sourcelinks below. I said the same thing in regards to paying $649 for a midrange phone when I can get the S9 for about the same price. I find it hilarious that some people are so threatened by a comment from a previous article that they are trying to pick a fight in this one. I guess they have to compensate somehow lol. I find it so hilarious that the people claiming that others are staring fights here and that are threatened by comments from other articles are the ones that are actually starting fights here and threatened by comments from other articles, lol. They are certainly compensating for something, lol. I find it hilarious that some people were so desperate to get a fight going that they actually tried to throw shade three days later just because their last baited response was a failure. Of course failure is something some people are used to. I find it hilarious that people talk about shade and desperate for a fight concerning others when they throw shade at people that aren’t even on the same article as they are. Talk about hypocrisy, lol. Of course, being a hypocritical failure at life is what they do best. I found recently two offers of new pixel 128gb version for $270 on eBay. For $270, you get a still cutting edge device with 128gb of storage that's usable on ALL carriers unlike some phones that are still charging ridiculous prices despite being over a year old with midrange specs. $270 for an outdated, bug-prone smartphone is still too much. The only thing “cutting edge” about these Pixels are the level of bugs that they have, lol. Should be $150. Don't be mislead by people who mean to spew false information and conjecture just because they don't know what they are talking about. Don’t be mislead by people who don’t even own the smartphone to begin with, but get triggered nonetheless and have to spew nonsense in an attempt to deflect from the real issues the Pixel line faces. Don't be misled by people who have no clue what they are talking about just because they are triggered that a two year old phone is still a better deal than a new phone with a high price tag and midrange specs. Don’t be mislead by those that feel so threatened by inanimate objects that they have created 10 accounts (9 of which are banned) just to attack them. They also like to deflect from the real issues that Pixel devices are having. They have no clue as to what they are talking about, lol. Some people like to project their own faux accounts onto other people just because they were outed by other users. As you can see, fake geniuses are a thing especially when you are talking about tech and smartphones. Some people live in denial about their faux accounts as if they haven’t been called out by NUMEROUS people for it. They project their faux account ways onto people, even though deep down they know that they are the ones on their 10th account because I got them to deactivate their first account and got 8 of their other accounts banned. As you can see, fake venomous individuals haven’t a clue as to what they are talking about on a tech site, and are a huge embarrassment here. There are still outlets that have the original Pixel for sale?? I’ve been seeing a lot of other sales/discounts/deals for Pixel devices (1st and 2nd generation). Guess many outlets got stuck with a lot of inventory. Probably due to a combination of high price tag and too many bugs/issues. Hopefully, Google has these issues ironed out with the release of the third generation Pixels, but I won’t hold my breath. Yeah B&H still sells. They are so popular there. Not popular enough if there is still stock of the 1st generation Pixel, lol. Yup. Unlike some companies that are still charging $500 for last year midrange specs forcing carriers to have a contract fire sale. Speaking of fire sale, that’s exactly what this is, lol. Google couldn’t get outlets to get rid of their bug-prone smartphones at regular price, so now these outlets are forced to resort to a fire sale to get rid of them, lol. Truth really seems to hurt some people, judging by a comment made. 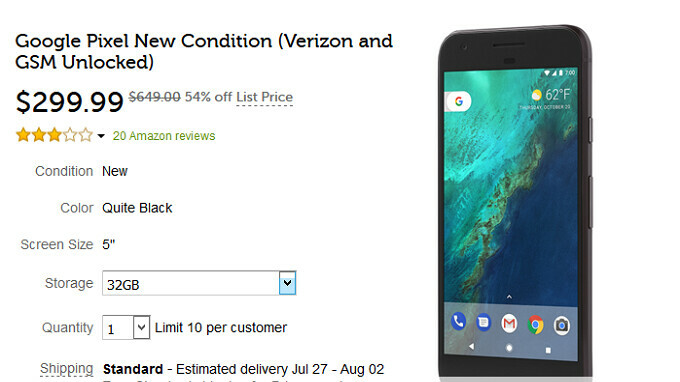 Google is having a fire sale of a two year old phone? See people this is why you should never listen to someone who doesn't know what they are talking about. Many flagship phones that are over a year old go for prices that are affordable. I mean it's not like a company that still lives in the past and believes that people will spend a lot more for mediocre specs and brand name alone. It’s amazing how people get so triggered by what someone says that they incriminate themselves, lol. Here they are saying that most companies lower the prices of smartphones that are a year or more old, but incessantly bash other companies that they troll for doing the exact same thing. Talk about pot, meet kettle. This is why you shouldn’t listen to those who have a record of trolling here. They have no idea what they are talking about, and are often hypocritical to boot, lol. Speaking of records, some people have a track record of picking fights and dragging them on to compensate for their lack of knowledge and smarts pretty much invalidating part of their name. I guess they should have stuck to just being a geek because they are definitely not a genius. Speaking of records again, these same individuals with the track record for trolling have a record of creating 10 faux accounts (9 are banned now) to troll an OEM because I favor them. They pick fights with me because they’ve been banned 9 tines because of me. They have no knowledge of smartphones, and have already been outed for posting photoshopped images of smartphones that they don’t really own, lol. I guess they should have just remained court jesters like Superman’s impish enemy, because they are failing hard at spewing venom. Some people are once again just mad just because the truth has been stated that they are once again spewing conjecture. Newsflash, saying something over and over again isn't going to magically make it true. So much for lighting striking hard. Like I said before, they should have just stayed a geek because they are definitely not a genius. Some people here get so triggered by the truth that they rage on and on, only to run away like cowards in the end. Newsflash: being in denial about the truth doesn’t make the truth any less true. Fortunately, the truth doesn’t need them to believe it for it to be true. So much for acting in a flash. Like I said, they should have stayed an impish jester like Superman’s arch nemesis, because the venom that they spew is akin to a trickle of water from a broken pipe. A few months ago I paid 250 dollars on eBay for a brand new original Pixel 32 GB. The battery life isn't that good. I wouldn't buy this phone again.